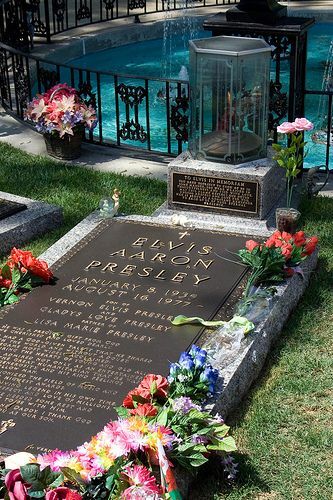 August 16, 1977 the world was hit with the devastating news that Elvis Presley had died at the young age of 42. 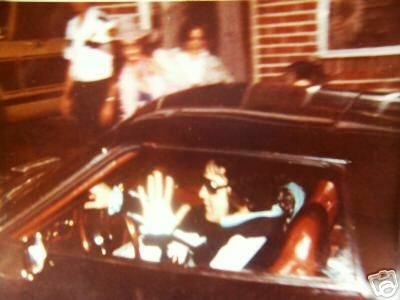 The last known photo of Elvis was taken on August 16 around 12:30 a.m.
Elvis' last day on earth has been highly documented by his friends, family and doctors. On August 15th Elvis woke up around his normal time of 4:00 p.m. 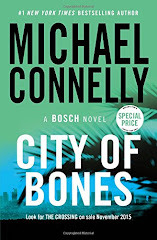 He spent the evening watching television, playing with Lisa Maria (who was at Graceland on summer vacation and was set to return to Los Angeles in the next few days) and in the company of his fiancé Ginger Alden. He then left Graceland around 11:00 p.m. to visit his dentist. 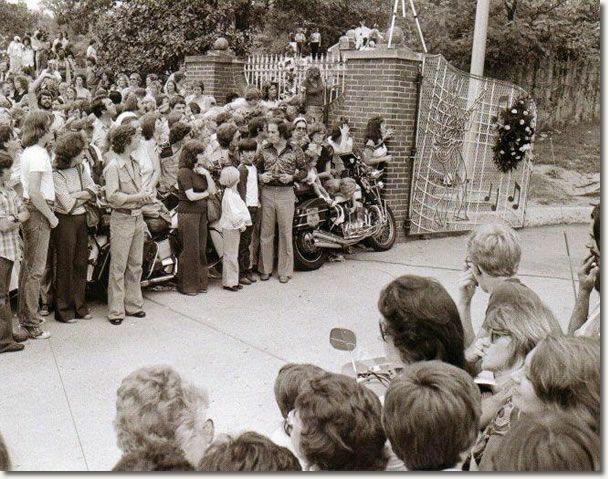 He returned to Graceland around 12:30 a.m. driving his Stutz Blackhawk through the gates and waving to fans at the gate. Around 2:15 a.m. on the 16th, Elvis started to feel some pain in his teeth. He called his personal physician Doctor Nick and asked for something for the pain. He prescribed him 6 tablets and one of his assistants picked up the pills at an all night pharmacy. Once Elvis began feeling better he called his friend Billy Smith and asked if him and his wife would like to play racquet ball. Once they arrived they played on the racquet ball court on the property and then went into the den area beside the court. Elvis sat down at the piano and played for a little while. His last song that he would ever sing was Blue Eyes Crying in the Rain. Elvis stayed up for a few more hours then proceeded to go to his bedroom. At this time in his life, Elvis was highly dependent on drugs to help him wake up and go to sleep. He had prescribed packets of medication for all of his ailments and issues. He would take these prescribed packets and 3 different times of the day. Once he returned to his bedroom, he took one of the prescribed packets to help him sleep. Shortly after, Elvis told Ginger that he was going in the bathroom to read. Ginger told him not to fall asleep in there and he responded with, "Ok, I won't." At 1:30 p.m. Ginger woke up to find that Elvis was not in bed. She called her mother, got up and put her make up on and then walked over to the bathroom door. She softly knocked and didn't get a response. Then she pushed open the bathroom door and saw Elvis. Colonel Parker and Priscilla were the first calls made from Graceland. 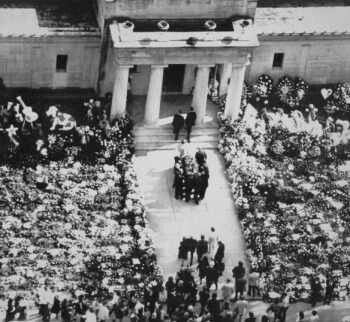 Once news began to spread of Elvis' death the world went crazy with grief. Immediately after his death, the world wanted answers. The corners office began doing an autopsy on Elvis and determined the cause of death to be Cardiac Arrhythmia due to a undetermined heartbeat. They also quickly learned that Elvis had over 14 medications inside him. They also believed he could have went into anaphylactic shock due to a slight allergy to the medicine that was prescribed due to the dentist appointment earlier in the night. 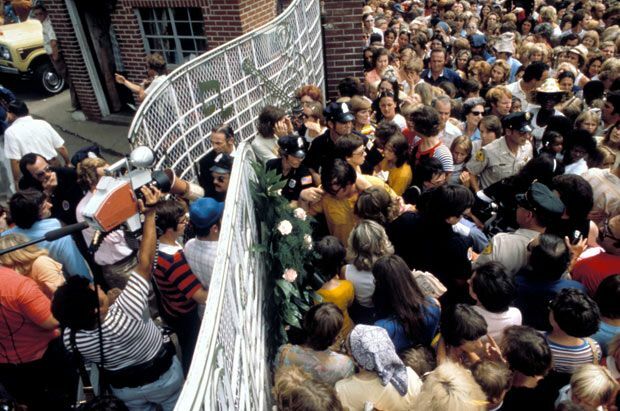 In the meantime, fans flocked to the gates of Graceland. Quickly, florists in the Memphis area began receiving flower orders that rose to 3,000. The phone company had to ask residents to only place emergency calls due to the large influx of calls. 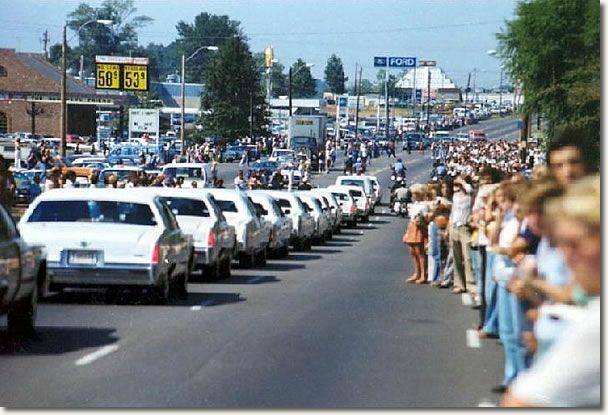 Before the casket could arrive to Graceland for the home service over 50,000 fans had made their way to Elvis Presley Boulevard. 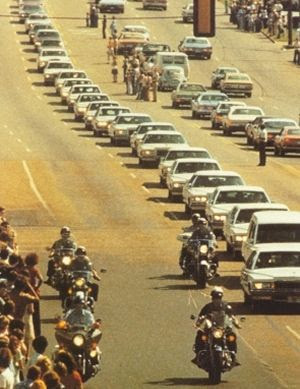 They all wanted to see that it was true, that the King really was gone and to get a glimpse of his copper casket. Fans were brought up from the street four at a time to view and pay their respects. The line stretched over a mile long. Fans began to faint in the over 90 degree weather. On the inside of Graceland, turmoil continued with the family and close friends. They all walked around in a daze not wanting to believe their good friend was gone. Elvis was buried in the same place as his mother. 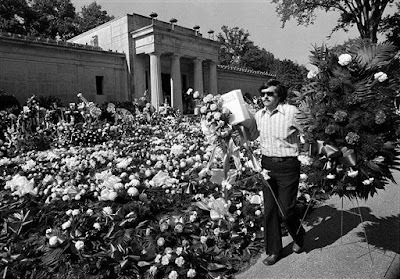 At the request of his father Vernon, the body was moved a few months later to the meditation garden at Graceland. Security concerns were high and the family was worried someone would try to disrupt Elvis' body. 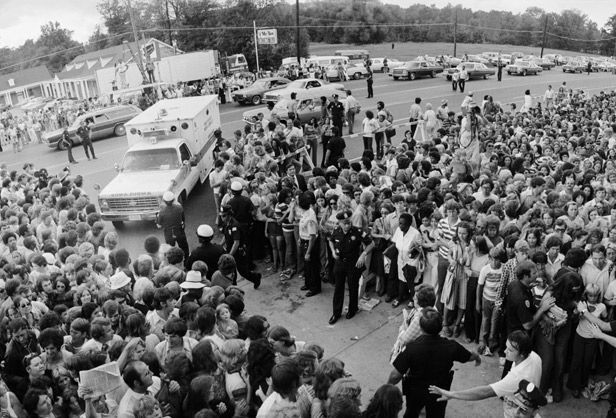 Once the services were held, the fans continued to flock to Graceland. At the time of Elvis' death he was financially in trouble. Priscilla who had taken over the large portion of the estate in the name of Lisa Marie realized if they were to keep the property they needed to raise some money. She decided to turn Graceland into a museum for his fans and that's what it remains to this day. Many people still wonder how Elvis, the King of Rock n' Roll could be almost broke at the time of his death? Well that's simple. Elvis loved to give. He would give strangers the shirt of his back. He also had a large payroll each month and upkeep on his planes, property and staff. 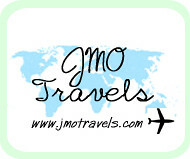 He was set to go out on tour and that would have kept him financially secure. That day never came though. The fans would never get to see the King perform again. We lost a legend that late summer day in Memphis. Makes you wonder if he hadn’t done drugs where he’d be now, and how history would have changed. My dad still talks about this day. I am 50 years old this year so i was 11 when he died. I still remember it like it was yesterday. I had fell asleep on the sofa and my older brother woke me up saying Elvis is dead. I guess many people remember that day well.